George III, the king famous for going mad, and other members of the royal family were guests at Woodlands, as were distinguished artists like Sir Joshua Reynolds and Sir Thomas Gainsborough, as well as Dr Samuel Johnson, compiler of the first great English dictionary, and the celebrity actor David Garrick, all of whom must have looked out on the gardens to the north of the villa, and may even have walked there. 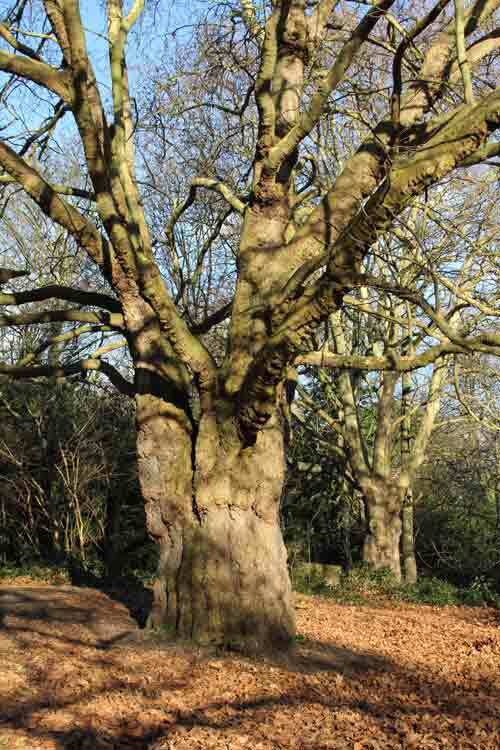 It seems likely the two magnificent rows of veteran London plane trees were planted by John Julius or his heirs, who raised their own families at Woodlands. It seems as if the initial west side of a plane avenue is in Mycenae Gardens while the more distant east side is in Woodlands Dell, fronting Mycenae Road. Anyone with information about the avenue can contact the Friends. When I moved in to 10 Hardy Road in 1975 there was a line of Elm trees parallel with the plane trees and to the west of them . All but one got elm disease and were cut down, I am not certain if the survivor is an elm tree, but since the row was cut down it has gone from being a tall thin cramped tree to the tall lovely tree it is today and has spread out. It is head and shoulders above the surrounding trees. If it IS an elm it may be of interest to those who are cloning dutch elm disease resistant trees?